Wayde van Niekerk is a South African Olympic style events sprinter who contends in the 200 and 400-meter races. He was conceived on 15 July 1992 in Kraaifontein, Cape Town to Wayne van Niekerk and sprinter Odessa Swarts. He attended Bellville Primary until he and his mother moved to Bloemfontein in 2005. At Bloemfontein, he went to Grey College before going on to study marketing at the University of the Free State. 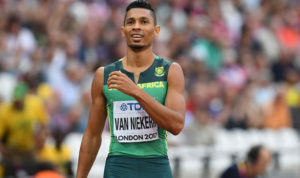 Van Niekerk in 2016 became the first sprinter in history to have run the 100 meters in under 10 seconds, 200 meters in under 20 seconds, and 400 meters in under 44 seconds. He previously held the South African records for both the 200 meters and 400 meters and he also currently, he holds the record for the 400-meter race. He was born on the 15th of July 1992 in Kraaifontein, Cape Town. As of 2018, he is 26 years old. He is currently married to Chesney Campbel. Their wedding took place on the 29th of October 2017. His father’s name is Wayne van Niekerk while his mother’s name is Odessa Swarts. After some few years together, his biological parents divorced, and he began to live with his mother Odessa Swarts and step-father Steven Swarts in Bloemfontein. I keep fighting for what I believe.